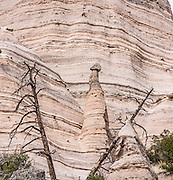 See fantastic hoodoos and a great slot canyon in Kasha-Katuwe Tent Rocks National Monument, in New Mexico, USA. Hike the easy Cave Loop Trail plus Slot Canyon Trail side trip (3 miles round trip), 40 miles southwest of Santa Fe, on the Pajarito Plateau. Distinctive cone-shaped caprocks protect soft pumice and tuff beneath. Geologically, the Tent Rocks are made of Peralta Tuff, formed from volcanic ash, pumice, and pyroclastic debris deposited over 1000 feet thick from the Jemez Volcanic Field, 7 million years ago. Kasha-Katuwe means "white cliffs" in the Pueblo language Keresan.